The matter of dealing with the Rock Art of the Sahara as well as with non-European, prehistoric or so-called primitive art altogether raises a number of questions: in how far are they accessible to modern understanding? How much respect do they require, how much liberty does it allow? Past experience has shown that the greatest restraint is necessary. We also have to accept that to many questions there is no answer. Another consideration to be discussed is whether personal experiences of one’s own has to be excluded while dealing with these alien works of art coming from faraway places. We’re assuming that a personal view is indispensable since it opens access to the Rock Art without insisting on a final interpretation. The Rock Art we’re starting from are being put into a worldwide artistic and aesthetic context. They show that at all times and at different events human beings have tried to express and to mediate – for themselves but maybe also for others - their life and their world visually (namely in a world view). Insofar the free dealing with these alien works is a prerequisite for their appropriate and just appreciation. While proceeding this way another matter coming up then would be whether the works of art aren’t being colonized again in a new sense. Under the assumption that, as understood in Postmodernism, everything is linked to everything, that there are no limits and no reserved domains, which is also true for the arts, then we try going into Rock Art and forms and appearances of alien works of art and to continue them, but with our own means. At the same time we accept that other people deal with our own art in pretty much the same way. When we associate – always with the necessary reservation - Sahara Rock Art with Louis Soutter or A.R. Penck then we’re also doing so the other way round in that we compare Soutter and Penck’s works with Rock Art. We then identify a permanence of artistic ways of expression and a correspondence of motifs and recognize, this way, the creative potential of man. So our approach isn’t all that comparing or analyzing but rather associative. It connects what’s close and what’s near, what’s one’s own and what’s alien. In this way we’re not multicultural, but rather transcultural. To us, the Internet seems to be the ideal place to connect the most different artistic and creative initiatives of people all over the world and at all times. It suits us very well insofar as it makes connections and furthers the circulation, connecting and disseminating. The Internet can also be used for a worldwide cultural exchange, with sampling as the ideal method. Everything can be connected with everything. 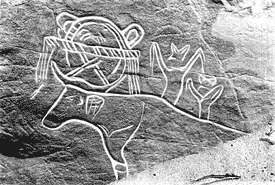 In this endeavour we visually present Rock Art examples and emphasize, with drawings, their characteristic picture ideas. But by and by we’ll also bring together Tripolis street sgraffiti with Sahara rock art and show, in this way, how the same ideas have evolved in a comparable but not the same way; we’ll be presenting modern Libyan artists; we’ll be quoting from – and in order to round it off publish - written documents and give recommendations for further reading. Jörg Mollet who, as an artist, had himself stimulated by the desert, by Rock Art and stone settings, and has implemented his impressions in his work, and Aurel Schmidt, as a writer, will be making their own contributions on the topic and to this Internet project. We know that we’re not the only ones working on the topic of Sahara rock pictures and we wish to get into contact with all the other creative people. Different from book publications the Internet seems to be the ideal means for this purpose. It enables one to proceed in a step by step, mobile way and is an open medium which suits our intentions. That is, we can continuously work an the Swiss-Libyan Art Project, expand it successively, change and alter it without being compelled to a final form. Thus this Internet project with its aims and associative linkings claims to be a work of art, a total art work in itself. Should the opening up of rock art and its often unbelievable formal boldness and overwhelming beauty to the public turn out well an essential matter has been fulfilled. 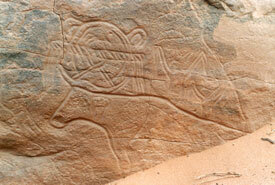 Today, the Sahara Rock Art and paintings are extremely endangered and have to be preserved. The oil industry is active in the Libyan desert and exposes the works of art to high risks. To what extent the clima change adds to their endangering is hard to say but cannot be ruled out. A third threat comes from tourism and from robbers. What we’re aiming at is to call the great artistic quality of the Rock Art to the public’s attention but also, warningly, to their material endangering.